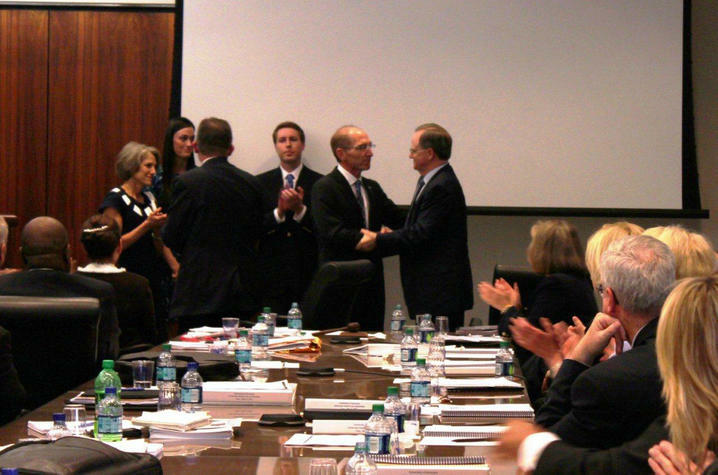 LEXINGTON, Ky. (May 3, 2011) — With a unanimous final vote today, the University of Kentucky Board of Trustees selected University of Alabama Birmingham Provost Eli Capilouto to be UK's 12th president. The vote followed a rigorous Monday of meetings and faculty, staff and student forums for Capilouto, who told the campus community that he was impressed with the university and would be honored to serve as president of UK. He will begin July 1. Attached are audio clips from the Board of Trustees meeting with Britt Brockman, Jim Stuckert and Capilouto, as well as clips from the media interviews with Capilouto that followed the meeting.